Substations Turnkey Compact Substations up to 35 kV. 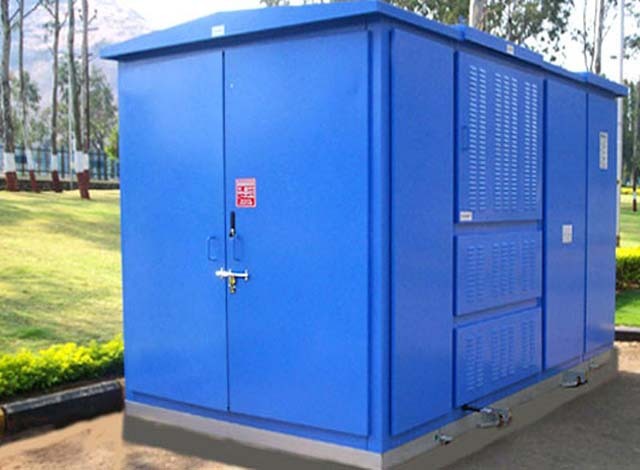 We offer wide range of compact turnkey substations. No costs for on site assembly and minimal civil engineering. The small profile of the substation makes it easy to install discretely in sensitive locations. It guarantees high level of safety. The MV compartment can be equipped with wide varieties of MV switchgear. For voltages up to 35kV, the basic configuration is a SF6 insulated RMU which consist of two load break switches and one switch-fuse combination for transformer protection, all contained in a single sealed tank. Transformer compartment is specially designed to provide the transformer with adequate airflow cooling through well sized openings. The compartment is provided with a pressure relief system integrated in the ceiling/roof. As an option, a floor mesh can be provided to prevent entry of small animals and other foreign objects, assuring in the meanwhile continuous airflow and circulation. Oil-immersed or dry type transformers can be accommodated on this compartment. Natural ventilation is provided through ventilation for air intake at the bottom of the walls. The air is extracted through ventilation openings at the top of the walls, and natural air circulation ensures sufficient cooling to the distribution transformer. The ventilation system is classified and type-tested in accordance with temperature class K20. Temperature class K10 can be achieved by increasing the ventilation area for the transformer room. The substation forms a complete metallic bolted structure. Each compartment is provided with grounding busbars. Bonding and interconnection of the grounding buses are made of 70mm2 bare stranded copper conductors. The ring main unit (RMU) and the low voltage panel (LVDB) are provided with grounding bus that can be connected to the grounding system at site. The unit is mainly made of corrosion resistant 2mm AlZn-coated steel sheet. The aluminium and the zinc alloy coating provide protection against corrosion due to harsh environment conditions. In addition, 3mm galvanized steel sheets are used to make the support in the base frame (oil collection pit) stronger. Contact us today and we will customize the compact substation as per your requirements.